Writing A Reality Novel: Are Literature and Cinema Propaganda Tools Against ‘Islamic Radicalization’ in Uzbekistan? Hamid Ismailov will discuss several Uzbek films (including "The square no 18", "Deceived woman", "Gone astray" and "The Traitor") as well as short stories, showing how state propaganda works through and distorts representations of reality. As an alternative approach, he will present his own 'reality' novel, A Poet and Bin-Laden. According to the Times Literary Supplement, the novel's "insights into Central Asia are fascinating and its analysis of paramilitary Islam is far more nuanced than the binary cultural opposition of, for example, Mohsin Hamid's hugely successful and in some ways analogous novel The Reluctant Fundamentalist (2007)." 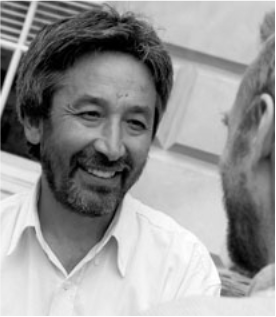 Hamid Ismailov was born into a deeply religious Uzbek family of Mullahs and Khodjas living in Kyrgyzstan, many of whom had lost their lives during the Stalin era persecution. Yet he had received an exemplary Soviet education, graduating with distinction from both his secondary school and military college, as well as attaining university degrees in a number of disciplines. Though he could have become a high-flying Soviet or post-Soviet apparatchik, instead his fate led him to become a dissident writer and poet residing in the West. He was the BBC World Service first Writer in Residence. Critics have compared his books to the best of Russian classics, Sufi parables and works of Western post-modernism. While his writing reflects all of these and many other strands, it is his unique intercultural experience that excites and draws the reader into his world. His novel The Railway (Russian: Железная дорога), originally written before he left Uzbekistan, was the first to be translated into English, by Robert Chandler, and was published in 2006. Another novel, A Poet and Bin-Laden (English translation of "Дорога к смерти больше чем смерть"), translated by Andrew Bromfield, was published in September 2012. His triptych of novels, "Мбобо", in English The Underground (published worldwide by Restless Book), Googling for Soul and Two Lost to Life have also been translated into English. His book The Dead Lake (English translation of "Вундеркинд Ержан" by Andrew Bromfield) was published by Peirene Press early in 2014.